The new LG Q6 is now available in the Philippines! The phone that has had everyone Qrious, the new LG Q6, is here! Imagine if someone took your wishlist of camera features and put them into a single phone. That’s what the LG Q6 is. This phone features an expansive 5.5” IPS Full HD + FullVision Display, with a 18:9 full body aspect ratio, which not only offers maximum space, but also allows easy multi-tasking since the screen can be divided into two perfectly square windows that can be viewed either vertically or horizontally. The Face Recognition technology lets you unlock the phone simply by smiling directly at the camera—no more tapping or sliding your finger across the screen. The Square Camera Mode enables four different creative shots: Match shot, Grid shot, Guide shot and Snap shot. It also allows the merging of two images into one, as well as the creation of square grid collages. The Wide Angle Camera takes 100-degree group pictures even without a monopod or selfie stick! 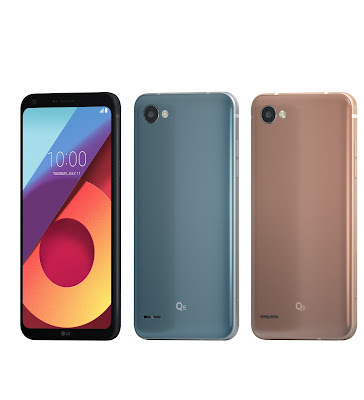 The LG Q6’s metal frame is made of 7000 series aluminum with rounded corners, so it is surely durable and can withstand many every day stresses. It operates on the latest Android Nougat. Everything you want for capturing moments and sharing them with the world is on LG Q6—chock-full of features you want, plus features that you never would have imagined. So get yours now and start snapping and sharing! SRP is P 12,990.00. You may buy it through all authorized dealers nationwide. Plus, you can simply click over to Lazada visit LG mobile’s official store, MemoXpress and Abenson and to purchase and have it delivered right to your door. Join #LGsQuad! Post your first LG Q6 experience on Facebook or Instagram using the official hashtag #LGsQuad to bet a chance to win a sleek LG Q6 Hard Case.